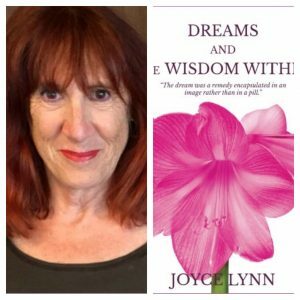 Joyce Lynn is a journalist, author, and speaker on dreams and spirituality. For Joyce, dreams have guided all aspects of her life, especially her writing, health, and advocacy for social change. Joyce is known for her expertise on dreams as a spiritual practice and a tool for personal and social change. Joyce is the author of Dreams and the Wisdom Within exploring the healing power of dreams. The book is part memoir, part scientific manual, part spiritual guide. Her book, PLUM DREAMS DIARY: On Mothers, Men, Modern Medicine, and the Divine, a collection of dream accounts, explores the contemporary female psyche. Joyce extracts dreams from the realms of psychology and religion imparting our nighttime messages as a mandatory modality in our daily lives. Dream On! Salons – Using Dream Guidance for Personal and Planetary Change,” selected cities — Columbus, Ohio; San Diego, California; Louisville, Kentucky; San Francisco.